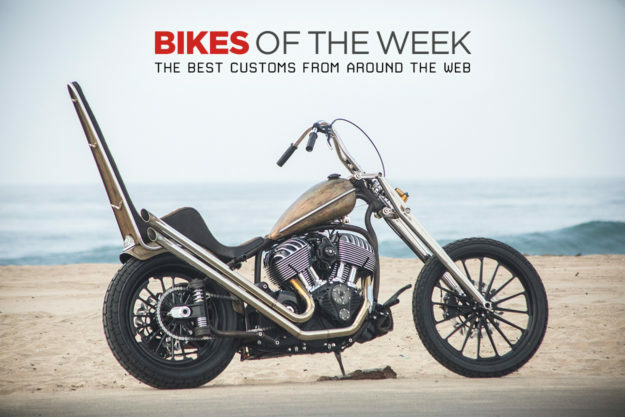 What happens when a notorious flat track nut decides to build a chopper? 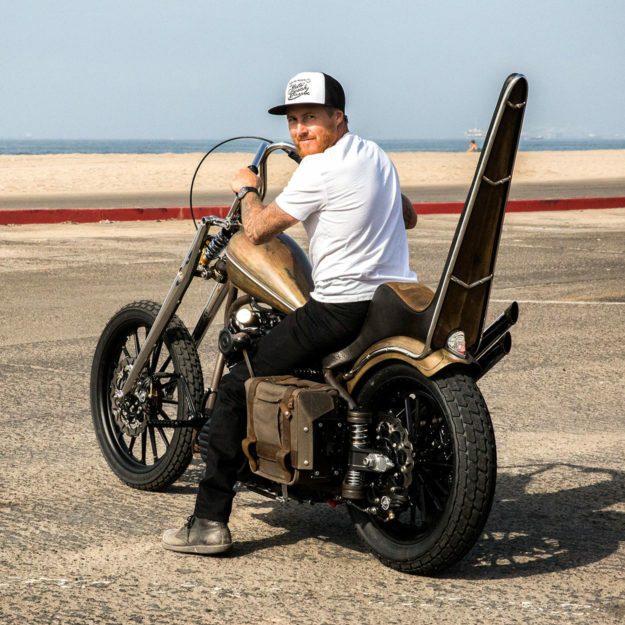 We take a look at Roland Sands’ latest build to find out. 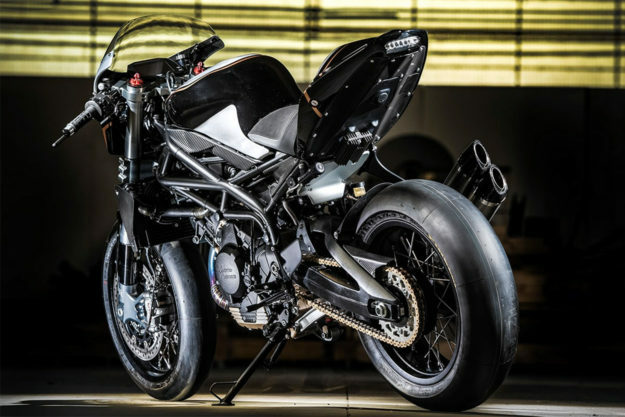 And then cast our eyes over a murdered-out Aprilia Tuono, the slinky new CCM FT6 tracker, and a monstrous CR500 wheelie machine. Aprilia Tuono by Ireful Motorcycles Of all the bikes I’ve ridden over the last few years, the Aprilia Tuono is easily one of my favorites. The ferocity of acceleration, the engine sound and the precision handling are even more addictive than nicotine. But not everyone is a fan of boy-racer bikini fairings. 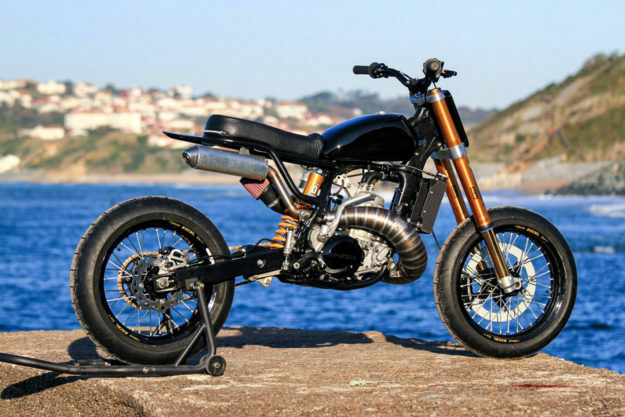 Dario Denichilo of Milan-based Ireful recently put a Tuono 1000 on his bench and the result, Tumultus 130, is absolutely gorgeous. All the liveried plastics have been binned, in favor of flowing, hand formed aluminum. The rear subframe is also all-new and creates an elevated perch, delivering an aggressive riding position while also hiding the electrics. 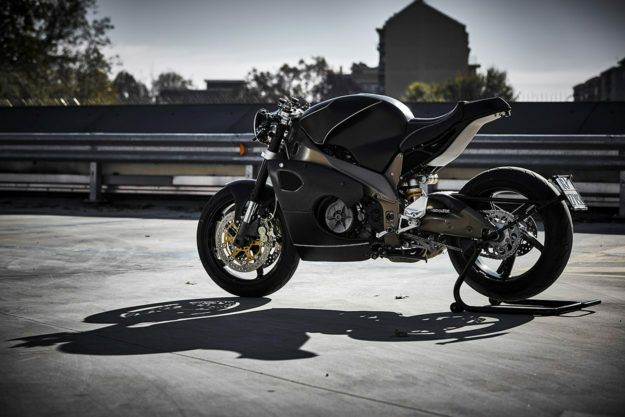 In profile, it gives this nouveau-cafe a look reminiscent of the Lotus C-01. And that’s no bad thing. 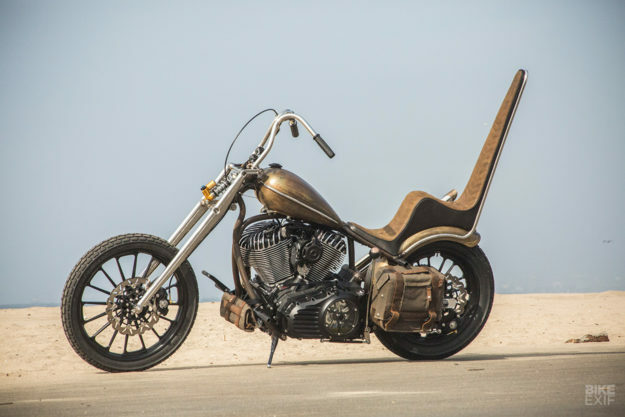 Indian ‘Mescalero’ by Roland Sands Design Choppers aren’t usually our thing around here. But every now and then, one sneaks up and demands attention. 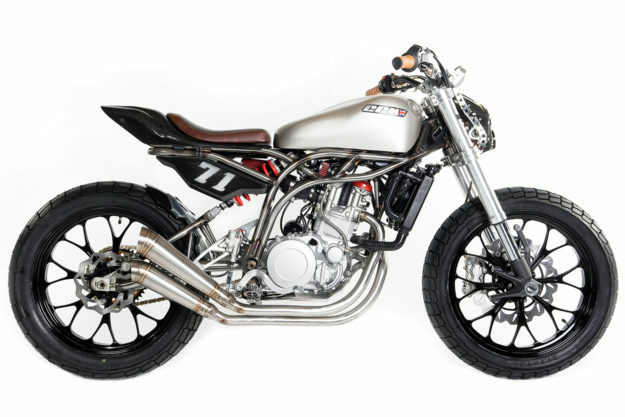 Such is the case with Mescalero, the latest creation from flat track and cafe icon Roland Sands. Designed to pay homage to a bike Roland’s dad built back in the 70s, Mescalero is a modern ‘road bomber’ powered by an 111 cubic-inch V-Twin from an Indian Chief. But outside of that powerplant, everything else is essentially custom, and completely old school. The chromoly frame is a plunger unit, giving it the appearance of a rigid without the spine-crushing ride quality. Up front, Mescalero uses a custom girder set-up with a little help from an Öhlins shock absorber. CCM FT6 Tracker Need evidence that the tracker movement is in full swing? Look no further than the latest bike to be green-lit by England’s CCM Motorcycles, the FT6. Based on the same architecture and engine used in their already tasty (and sold out) Spitfire line, the FT6 is a carbon-fiber clad runner. And it has real ties to the dirt oval: Ten years ago, Marco Belli rode a CCM to the European Championship. 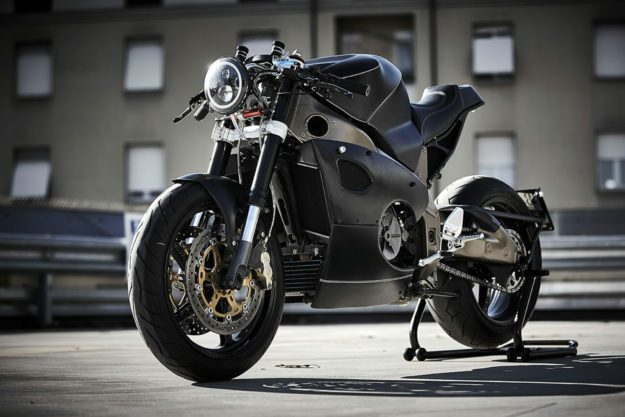 Like the other bikes in CCM’s portfolio, the FT6 will be a completely hand built model, bolted and welded together by an escapee from Lockheed Martin’s original Skunk Works. The 599cc thumper powering the FT6 is good for 55 hp, and rumor says it should tip scales at a scant 125 kg (275 pounds). Unfortunately, as with the drool-worthy Spitfires, the FT6 will be a limited production bike. Only 250 are set to see the light of day. But the good news is that this awesomeness can be yours for around £9,000 (US$12,000) if you’re quick. 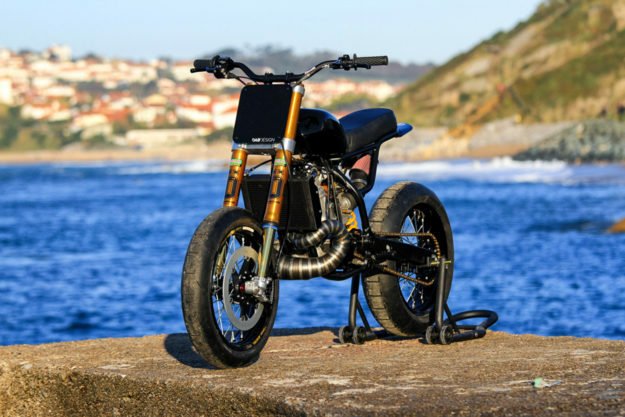 Honda CR500 by Dab Design To mark the end of a successful 2017 and celebrate a year in business, 26-year-old Simon Dabadie has created what might be the ultimate wheelie machine: a supermoto CR500. If you drooled over Simon’s last LM Series build you’ll know that he integrates 3D scanning and printing into his build process for optimal fitment and design. That process has continued here to deliver Dab’s signature LM look—but it’s the choice of donor that has us truly intrigued. 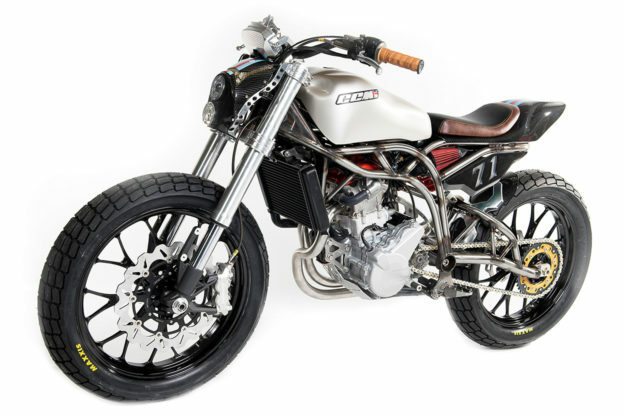 Moto Morini Ti22 Corsaro What is it about a custom build that speaks to you? Is it a slinky set of expertly welded pipes? Smooth, flowing, hand built bodywork? An exposed trellis frame? Or MotoGP levels of performance? How about all of those things, in one incredible package? Enter Moto Morini. The Ti22 Corsaro is an absolute masterclass in design and craftsmanship. It’s also the latest example of just what you can order from the Trivolzio, Italy manufacturer when you sign up for their ‘Yours and Yours Alone’ customization service. 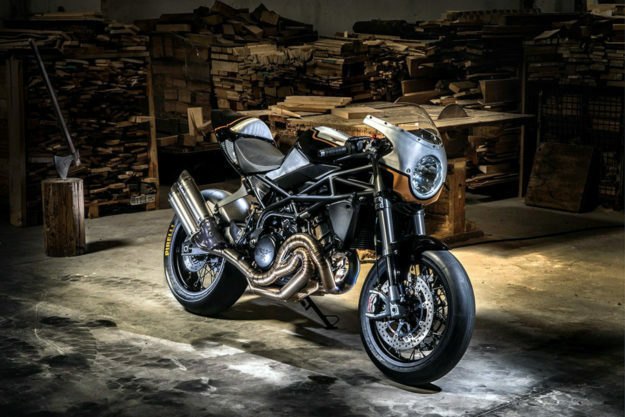 Based on Moto Morini’s already handmade Corsaro ZZ, the Ti22 version retains the trellis frame, Brembo brakes, fully adjustable Mupo suspension and 137 hp, 1200cc V-Twin found in the original. 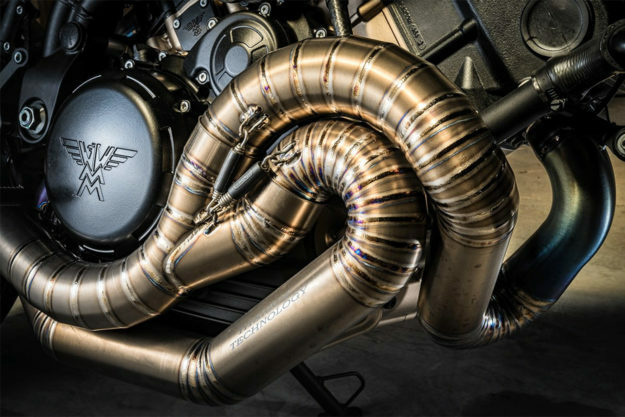 But it ups the ante with bespoke bodywork and one of the prettiest sets of pipes I’ve ever laid eyes on: a titanium, pie-cut exhaust custom made by the folks at Arrow.